Found a BEAUTIFUL full sized bed skirt in an ecru color with wonderful Battenburg lace all along the edges . . cost me a $1.00 at the thrift store. I cut the lacy sections off, allowing for a narrow hem to make long, narrow "curtains" to use on our tent for glamping. There are three long sections and there are three areas on the tent, both sides and the back. I'm anxious to see how they look. We had been using valance curtains, but thought these would work better because" 1) they are longer, and 2) by cutting them down to size and allowing just enough for the hem, they aren't as heavy on the tent fabric. Gosh, CJ I wish I had half your talent. and energy. You are truly a creative spirit. If you cut the collars and cuffs off old decorated sweatshirts they make neat crafts when hot glued around small gift boxes etc or can be applied to cheap plain new sweatshirts to dress them up again. Thanks girls . . . we DO have three good thrift stores and I've hit the mother lode more than once on wonderful linens for all kinds of purposes but also for our glamping. If you haven't seen our pics check out our "tent glamping" threads in OUTPOST. I realized I never posted a pic here of my teacup bird feeder, that I made using the Tip of the Week. I had posted one on the blog, but thought I should post one here, too. I cut my boys jeans off above the knees and made shorts! Why waste a pair of perfectly good jeans if only the knees are holey! Nicole, I have 2 of the same thing!!! I also have made them for family and friends. Annette, what a great idea...My daughter cuts hers off and rolls them up. The brand jeans she wears sells their shorts for $40!! she get s whole Summer wardrobe practically free. 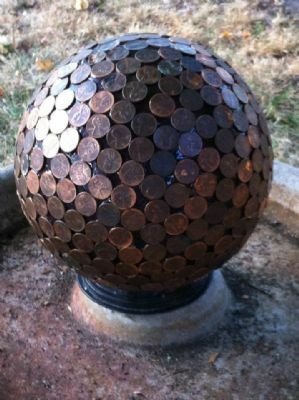 That penny covered bowling ball is so cool and I heard that it will deter slugs in the garden! I had my Dad's old potty chair collecting dust in my basement. His whole family and all my siblings were potty trained on this chair. I was wondering what I could do with it. The usual thing is to make it into a planter. I decided to make it into a dog water dish. I painted it with a water proof oil based paint and scrubbed the bowl (not the original). Easy and it is the perfect height for my dogs to get a drink from. Here is another recycle that I did. I had an old iron crib laying around. I spray painted it with rustoleum and removed one side. Found a cheap crib mattress at Ikea and covered it with fabric that matched my dining room. I made a three piece skirt with some scraps and added pillows. Made a cute little setee in my dining room! That is so awesome and useful! Nice re-purpose! This may seem silly but we were given two plain fabric grocery bags. I just found some reall cool green themed embroidery patterns so I though I would decorate those two bags with growing types of decorations. Nancy, you are a lucky woman to find that deal and have it turn out so wonderfully, congrats! Born a city girl but a farm girl at heart! I lined a couple of cabinet shelfs with the waste from doing a vinyl floor. I'm hoping that when they come back to do the other floor I'll get enough to line the rest of the cabinet shelves. ~"Be yourself; everyone else is already taken." Hi farmgirls: I just have to laugh. Now I have been collecting stuff for a long time. (I turned 70 July 8). Well I'll tell you what the cheapest re-purposing is...taking your own old stuff and working it into something new entirely. It is so much fun to go through things and "discover" stuff I forgot I had. Try it with a friend. You might just have what each other "needs". I really like what you did, Nancy, with that dresser. It looks great. Bonnie, I have to laugh at what you said about going through old stuff we have collected. I have so much "stuff" stowed away here in my sewing/art room. I have just finished another quilt and am working on a mixed media picture right now. It uses paper and cloth to make a portrait. Make everyday a celebration of the heart. This is not an original idea, but I took the packaging from my Mary Jane's Sheets to organize my holiday napkins. The napkins fit perfectly folded into a four square and lay flat. I reversed the label to show white and printed a sign on card stock using Word and inserting a clip art photo. It stacks neatly in my linen closet. I am glad to not throw away the nice zipped packaging. I used the hard cardboard insert for stability. Two photos are attached. "The turnings of life seldom show a sign-post; or rather, though the sign is always there, it is usually placed some distance back, like the notices that give warning of a bad hill or a level railway-crossing." Edith Wharton, 1913 from 'The Custom of the Country'. I like to take vintage table cloths, bed skirts with very pretty trim on them and turn them into clothes. I have made really cute bloomers and shirts. I take pretty china plates and cups make night lights out of them. I have taken glass plates and glass candle sticks an made cake stands out of them. Mens or womens oversized shirts to make dresses. I take vintage dollies and make purses. I make a lot of things with vintage clothing, I just bought a suit case full of things, among them are 3 of the vintage brassie(i believe they where bra's). I think I will make some really cute shirts with added lace, fabric and buttons may even add a few vintage hankies as pockets. My mind is always thinking of something new to make. Seems I never have time for me to sew for myself, someone always has something for me to do. I do quilting, I have 5 quilts to do right now. My boys tree house was condemned due to last fall's hurricane. We salvaged much of the wood, and used it to make this: http://cdn.backyardchickens.com/b/ba/500x1000px-LL-ba894c29_07132012FryingPanAmCollage2.jpeg I recently added better wheels - kids' bike wheels from one of our extra bikes. I also used Kitty Litter buckets as nesting boxes - but I have to admit, they were a bit small - maybe better for bantams, or maybe get bigger litter buckets? All the paint was leftover from previous projects as well. Do you all know of Habitat for Humanity's ReStore? 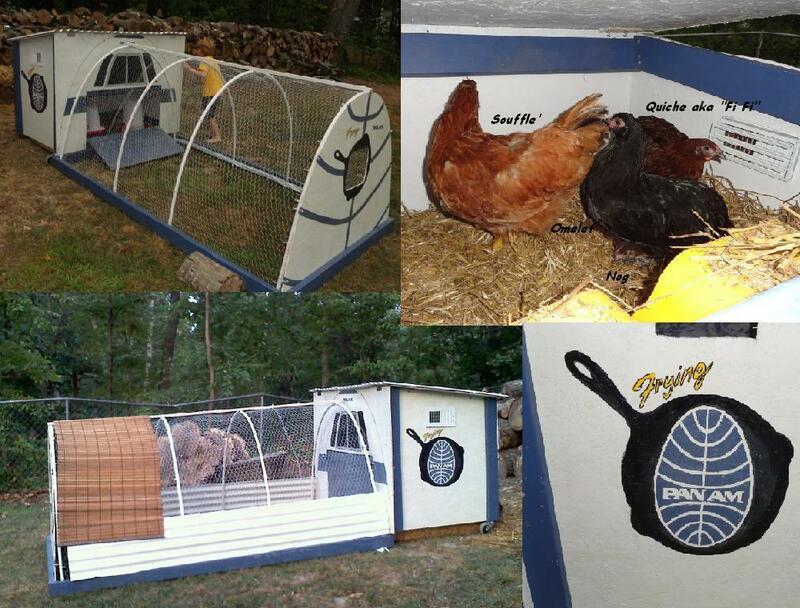 Yeah, I shop there too, and found many of the parts for my coop from there. I'm a RidgeRunner, and will always feel best when surrounded by the PA mountains. Still have license plate pieces from my big "Glamping Farmgirls" sign project left over. So, I took a couple little enamelware trays with strawberries on one side and pop-riveted these number on the back side to make Sisterhood number signs for my daughter and me. You can still see the strawberry side . . . and I still have two trays from the set. I like the metal because it's lightweight and will stand up to weather issues. Add a piece of baling wire (which we have plenty of) for a hanger/handle. AND, I still have license plate pieces . . hmmmm, what shall I do next? I order Stoneground Cornmeal from Dexter's Grist Mill in Sandwich, MA. It is delicious and comes from Organic Vermont Farmers and ground locally at the Grist Mill. The cornmeal sacks they come in are so charming, that I had to find a way to repurpose them. So I handwashed, air dried, snipped out the stitches, lightly ironed and made them into a pot holder using the thermal batting you can buy doubled. Now I have a keepsake from my amazing trips to Sandwich, MA and the Dexter Grist Mill. FYI, other great sites to see in town are Green Briar Jam Kitchen, Thornton Museum, Sandwich Glass Museum, nearby shores, and so much more. It will take awhile to get two more empty sacks to make a pair, but for now I have one repurposed sack. Yeah. Very nice, Annie. They sure fit into a country kitchen. Anyway, in the eighties when my parents divorced my mom had to go back to work. She worked really hard and always looked so put-together even if she didn't have a lot of money at the time. She bought these little silver skeleton earrings back then at a jewelry party, and always wore them in October around Halloween. Well, some years back, she gave them to me. Two years ago, I was walking the dog and realized I'd lost one. It made me sick! They were sentimental to me since they were my mom's.